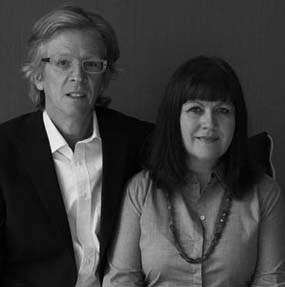 Kerry Stokes and Richard Bush are based in Eastbourne and Brighton in the south of England. They met at art school in the ‘80s (discovered they were born on the same day!) and their careers have crossed over ever since. They now have two grown-up sons. Kerry is the woven textiles designer at Chalk. She has had a long and interesting career working for companies from Japan to New York to Europe, designing men’s shirtings, airline fabrics, wall coverings, upholstery fabrics and towels, to name but a few. She has been a visiting tutor at Central St. Martin’s and Brighton University for many years. Richard, who studied Ceramics at Farnham, has owned an interiors business, and has also represented weave designers in New York and Europe. Kerry and Richard decided to draw on their design and business expertise and set up ‘Chalk’. The company offers contemporary, smart, woven products, and they are designed and woven in the UK. Chalk, although relatively new to the market, already has customers around the world.